The issue opens with the usual recap to get everyone up to speed (again) as we see Barry and Oliver have made it to Washington DC. They were a little too late to save some poor souls in an anti-war group, but Ollie uses the opportunity to give Barry more Ninth Circle background. You know...the assholes they are. Barry does some CSI work and when he heads back to Central City, Eric Shea will be so happy to see that Ben Percy knows the laws of chemistry have no bearing to the laws of the Speed Force...just like Orson Welles told us about Paul Masson Wine all those years ago. We then go off to a Arms Vendor Showcase and again, Eric is smiling...the place goes all Robocop and even I laughed at that! It's time for Green Arrow to spring into action, but after telling us some Advertising 101, he is visited by...Wonder Woman! Yes, Wonder Woman and boy is she pissed! 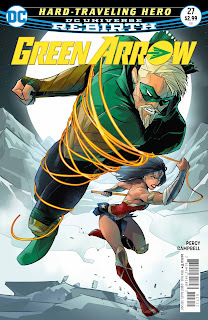 Just like with Flash last issue, we start off with a lot of shade being thrown by both parties before they join together to...well, they don't do much and the bad guy gets away. 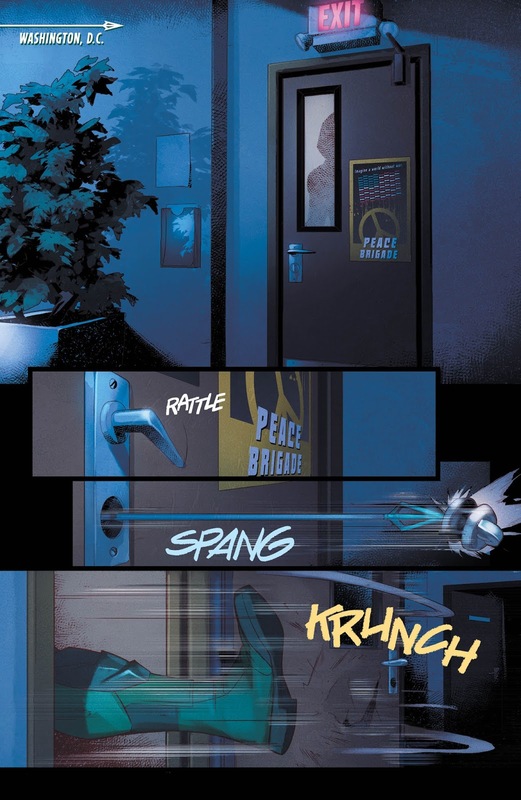 Back in Star City, we see Dinah and Emiko's plan and it's pretty basic, but brutally effective. They get one step closer to the Auctioneer and save some people to boot. Back in DC, Wonder Woman uses the lasso to find out Ollie isn't a killer (at least not in Wendy Poole's case). It's a shame that he can't just use that in court, huh? That leads to the two of them looking over an important Senator as she gives a speech that the Ninth Circle would surely be interested in. Interested they are, but luckily our heroes are on the scene. 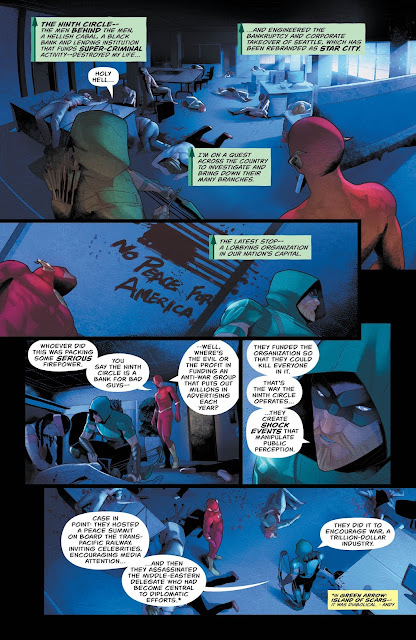 The issue ends with evidence that sends Ollie off to a familiar city that is ripe for yet another team-up. I understand this is the concept of this arc, but it really is a basic go from a to b to c story so far. I liked this a little more than last issue. Ben Percy does a better job with Wonder Woman than he did with the Flash and while the story was a bit thin, it was okay. I still want more meat to it all, but I guess I'll have to wait for that...again. Jamal Campbell jumps on the book and even with the large shoes to fill, does a good job. His style fits the book well, especially in comparison to Otto Schmidt. This was another okay issue that continues the Hard-Traveling Hero arc along in workman-like fashion. 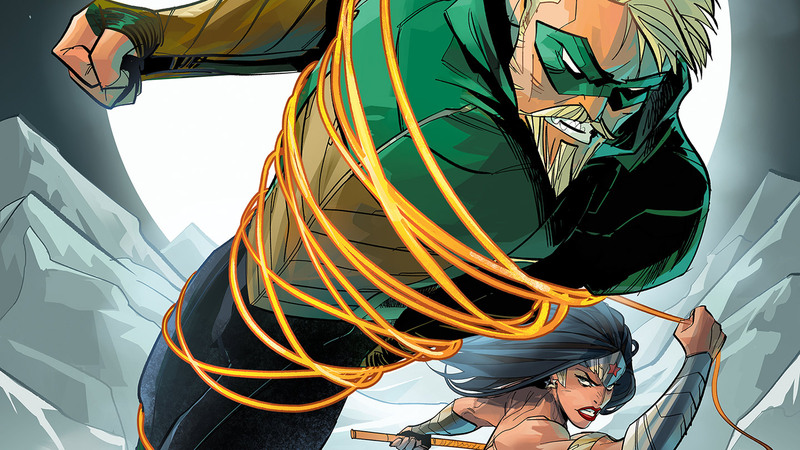 It's not going to knock your socks off, but if you yearn to see Green Arrow team up with members of the Justice League, you may enjoy what is going on here. I need more, but hey, I'm a bit of a jerk.